© 2015, Mike MacDonald. All Rights Reserved. This entry was posted in Chicago Nature, Cook County Nature, Digital Photography, Humor, Illinois Nature Photography, Macro Photography, Nature, Nature Photography, Photography Lessons, Will County Nature. Bookmark the permalink. 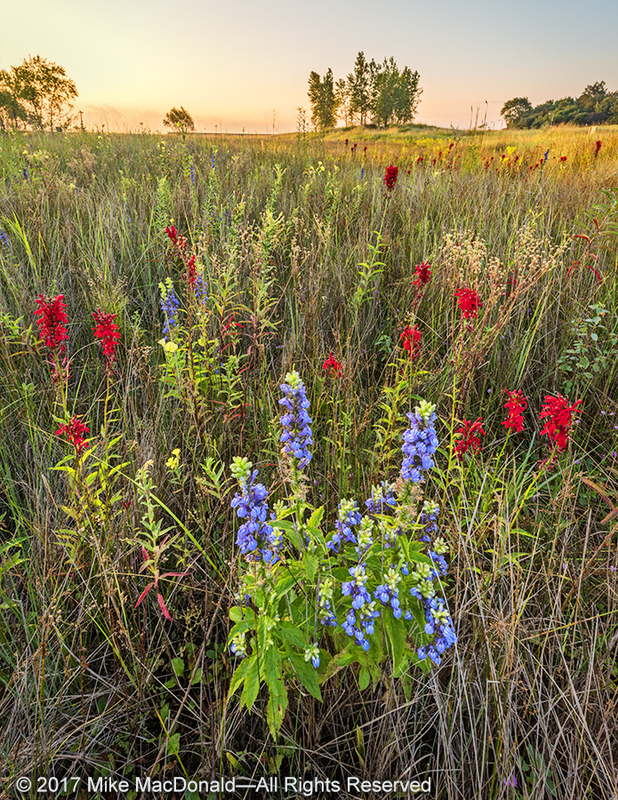 Great blue lobelia and cardinal flower in the panne at Montrose Beach Dunes in Chicago, Illinois. Later, the lease on my Subaru Outback was running out, and it was time to lease another one. Given how well things went with the paving company, I thought I’d give a similar pitch to the dealership. After a bit of back-and-forth negotiation, I made this offer, “In exchange for a free 36-month lease, I’d be happy to show off your car on the road. I’ll actually drive it, and everyone will see your beautiful Subaru. Many will want to buy one at your dealership, especially after I show them how fast I can pass them on a snowy road.” Both the dealership and Subaru agreed! They even threw in free carwashes so that the vehicle would always look its best. When my toilet clogged, most grossly, I called a plumber named John to fix it. After he performed the job and gave me a bill for $100, I turned on the magic, “Instead of paying you the hundred bucks, what if I just put your business card right here next to the toilet where everyone can see it. This way, any time someone takes a seat, they’ll see your ad. We can even make a sign with the clever line, ‘Plumber John fixed my John!’ Plus, I hold a big party every May. So, what do you say?” John was so delighted that he came up with his own slogan, “Plumber John will fix your John, just for a displaying a stupid sign like this!” Before I could respond, I heard a ringing that sounded like the phone in the home office. “I’ll get it later,” I said to John. After a few more rings, I awoke from my slumber. It was all a dream, except that he office phone was, in fact, ringing. I was under the weather, but decided to answer the call, anyway. I lumbered from the bedroom to the office and picked up the black handset. On the other end of the line was a woman from a Chicago-area nature non-profit organization. She gushed about how much she valued my work and that they wanted to use my picture on the cover of their annual report. Then, with great excitement, and not a bit of shame, she said, “And, in return, we’ll give you photo credit.” It was right out of my ridiculous dream. But this was real. Images that have taken me decades and hundreds of thousands of dollars to create, they want for free. What makes this so insulting and unfathomable is that these organizations are happy to pay the printer, the designer, the writer, the cleaning crew, and the decently-paid beggar who called asked for the handout. Everyone gets paid and, in turn, these people can put a roof over their heads and food on their tables. Yet, these “socially responsible non-profits” quickly lose their conscience when it comes to photographers. They don’t seem to care if I live in a cardboard refrigerator box under a flooded viaduct. And they don’t think that, to eat, I might have to fight off rats and seagulls to win the two rock-hard McDonald’s french fries from its discarded red box. Let’s call our home “Photographers Row”! It has a nice ring to it. In almost twenty-five years, I can count on one hand with two amputated fingers (the thumb isn’t a finger) the number of times that I’ve sold a picture because of a photo credit. And that includes being regularly published for over ten years in Chicago Wilderness magazine, which paid the photographers—even the amateurs. Unlike most people who work for a company, the only way that I make a buck is when someone buys something. And I don’t get a cent until I pay the many expenses required to run the photography business. 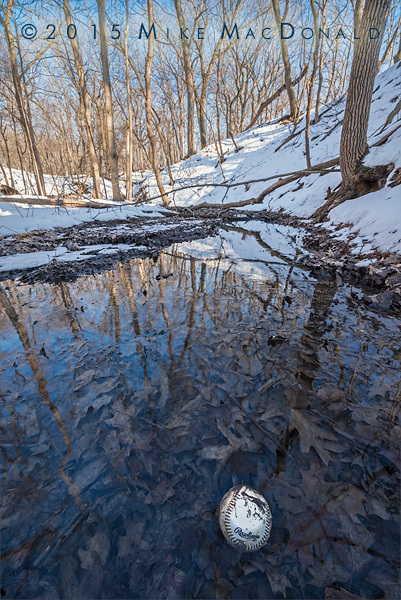 My photographs of the natural landscapes of the Chicago region are rare. Each represents a remarkable combination of beauty, technical quality, and editorial content. The work is internationally recognized. In fact, one of my images from Spears Woods will represent the month of September in the 2019 Sierra Club Wilderness Wall Calendar. Yet, overall, there is little demand for my work, thanks to the land managers of the region who, over the past hundred years, have done an abysmal job marketing their beautiful preserves and the value of nature. In response, I’ve been making pictures to promote our local preserves, even though there is no viable consumer market for my photographs. I’ve been shooting since 1993 and, still, I endure, despite the low patronage from those you’d think would want or need the work, like the many nature non-profits and nature-loving volunteers. I forge ahead with my goal of connecting Chicagoans with nature by celebrating the natural wonders of our region. I do this through photography, writing, and public speaking. And I charge for what I do, just like everything else in this world. And I take big risks. In keeping with my commitment, I invested $55,000 to publish the book My Journey into the Wilds of Chicago: A Celebration of Chicagoland’s Startling Natural Wonders and over $5,000 to create the free website called ChicagoNatureNOW!. People who donate to an organization want to know that they’re on a winning team. And winning organizations often have great photography. Can you imagine a website or publication consisting only of text—no photographs, not even bad ones? That organization would look like a loser and they wouldn’t earn a dime. Yet, a compelling and beautiful photograph has the power to instant convey a message, while also imbuing an air of excellence upon the organization. Great photography brings in the donations. If you represent a non-profit with a site that I photographed, I took a risk doing it. I did it with little expectation of compensation from you or anyone else. If you would have hired me to photograph it, you’d be paying ten times more and you still wouldn’t own the copyright. 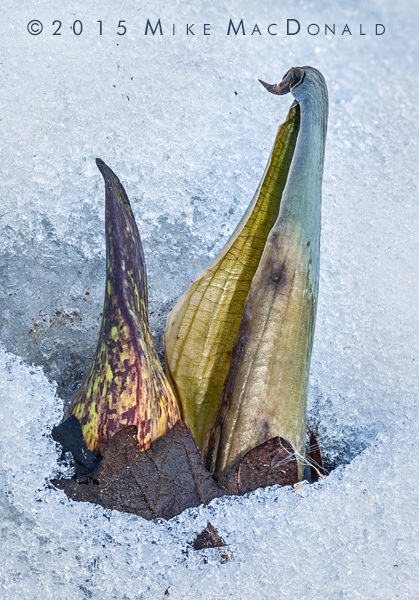 © 2015 – 2018, Mike MacDonald. All Rights Reserved. This entry was posted in Chicago Nature, Humor, Nature. Bookmark the permalink.